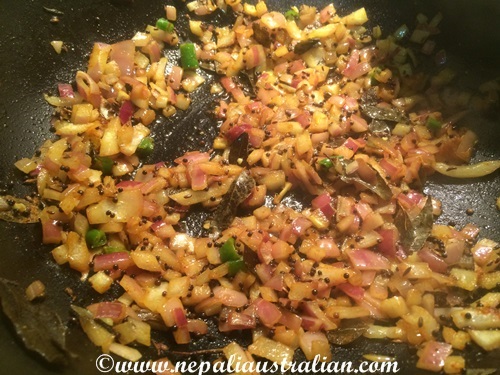 After having Chhori, I am always looking for easy and quick meals as I don’t have lots of time to spend in the kitchen. 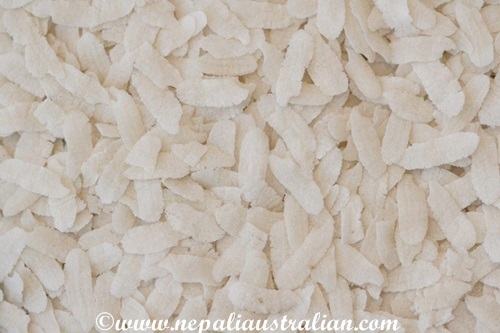 Chura (beaten rice) is one of the widely used to replace rice in Nepali culture. 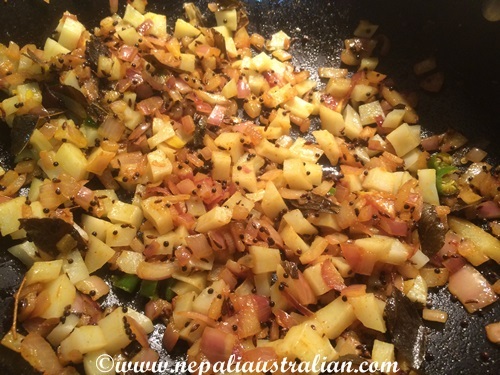 I used to make fried chura a lot with eggs and onion but recently discovered that they are very yummy with potatoes too so sharing the recipe here. I used flat thick Chura as shown in photo below. Make sure it is not too thin otherwise it will be very mussy when soaked. Gently rinse Beaten/Flattened Rice with cold water. Let it sit in a colander and drain the excess water and sprinkle salt. In a microwave safe container, add the cubed potatoes and add 2 table spoon of water, cover it and cook for 5 minutes. This process will semi cooked the potatoes making it easy to fry. Heat oil in a medium non-stick pan/work on medium heat. Add the mustard in it and when it starts popping, add the cumin seeds. Cook for 1-2 minutes until the onion gets soft. Add the potatoes and mix until combined. Cook potatoes for few minutes until tender but not mushy. 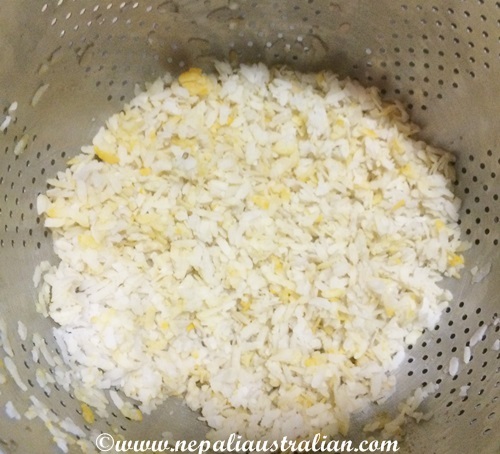 Add beaten/Flattened Rice and gently mix everything. Fried Chura is ready to serve. 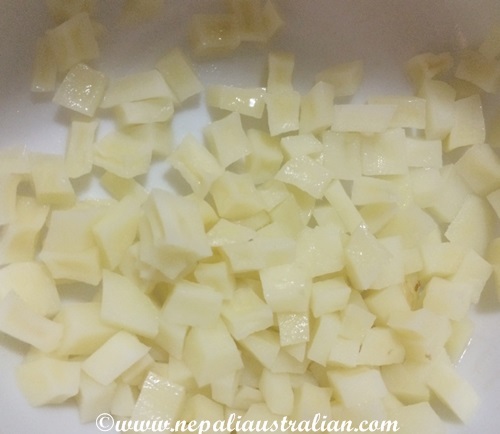 This entry was posted in Foodie, Nepali food, Recipe and tagged Australia, australian, australian nepali, Chura, easy food, M from nepaliaustralian, Nepal, Nepalese, Nepali, nepali australian, Nepali blog, nepali food, Nepaliaustralian, nepaliaustralian blog, vegi. Bookmark the permalink. 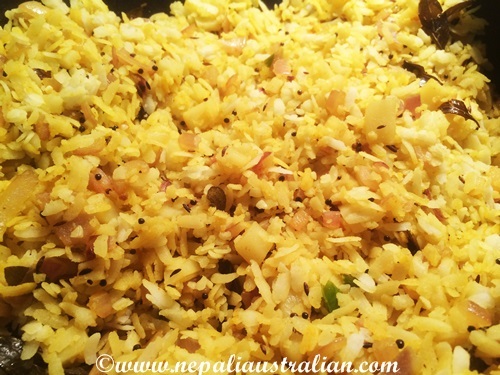 We call it Poha… my favorite breakfast… 😃 you can add peanuts and curry leaves too to enhance the taste..
Chiura has always been one of my favorite snacks 🙂 Thanks for sharing the recipe, I might try it if I get my hands on chiura someday soon!